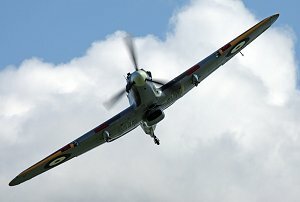 If there is a "Famous Four" of the most important allied fighter aircraft of World War II, then the cream of allied fighter technology must undoubtedly include the Supermarine Spitfire, the North-American P-51 Mustang, the Curtiss P-40 Kittyhawk and surely, the unsung hero of the Battle of Britain, the legendary Hawker Hurricane. This aircraft, born of the famous Hawker design stable, was the creation of the great Sydney Camm and was his response to the RAF's urgent requirement for a low wing monoplane fighter to balance the threat from Nazi Germany and its re-armament during the mid 1930's. Currently, there are only twelve Hurricanes in airworthy condition throughout the world; this is in spite of a total production of some 14,231 aircraft in the period from 1937 to 1944. Surviving Hurricanes in flyable condition are therefore amongst the rarest of all warbirds. Our example, originally built in 1942 has been restored to stock Mk IIB fighter-bomber status, the only flying example of the famous ‘Hurri-bombers’. 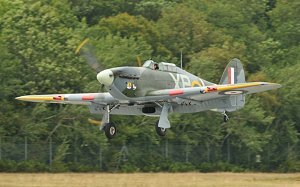 The Hurricane IIB gained prominence at a time when RAF Fighter Command went over to the offensive following the end of The Battle of Britain during which it had been. The 'Hurri-bombers', as they came to be known, bravely carried the fight to the European mainland in late 1941 and early 1942, initially armed with a pair of 250lb bombs and later with two 500lb bombs, together with an up-rated armament of twelve Browning .303 inch machine guns from the original eight. The Hurricane is undoubtedly the most complex of the wartime fighters to restore, with its intricate melange of steel, aluminium, wood and fabric, it represents an enormous challenge to return to flying condition. As such, this major restoration project was undertaken by the internationally renowned and pre-eminent Hurricane specialists, Hawker Restorations Ltd. 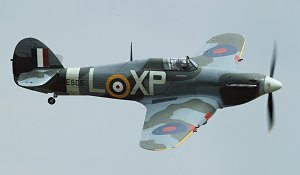 This company has restored no less than five of the thirteen currently airworthy Hurricanes and has a reputation within the historic aircraft restoration industry for work of the finest quality. 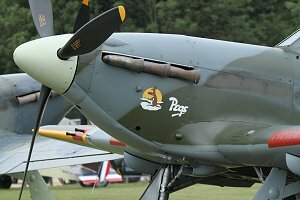 Based in Suffolk, UK and run by Tony Ditheridge, the undisputed Hurricane 'guru', HRL has a knowledge that spans many years of research and restoration of these wonderful aircraft. The engine is an original Packard Merlin 29 and has been fully overhauled to zero time by Maurice Hammond at Eye Tech Engineering. Maurice is undoubtedly the finest V-12 engine re-builder outside the USA and his attention to detail and originality is second to none. All other major components were tested, refurbished and returned to service and wherever possible we used the original parts, commensurate of course with safety. She ran for the first time in September 2008 and completed a comprehensive programme of ground runs. The complexity of the Hurricane’s primary structure, particularly Sydney Camm’s rejection of simple welded joints in favour of complex fabricated connections, was entirely aimed at easing mass production by relatively unskilled workers. Each joint and task was broken down into simple parts and jobs to allow sub-assemblies to be contracted out to non-aviation industries such as furniture manufacturers. These methods were familiar however to both Hawker production workers and the RAF fitters who maintained these aircraft. The legacy of this methodology, when compared to the Spitfire with its all metal 'monocoque' construction, is that the Hurricane is a truly massive undertaking to restore today. The average number of man hours allowed for a professional Spitfire restoration is generally estimated at around 12,000 hours. That should be considered against the Hurricane, upon which around 30,000 hours must be lavished before that distinctive shape can take to the skies once more. The history of our aircraft is one which begins at the Canadian Car & Foundry Company factory in 1942 as construction number CCF/R20023. The aircraft was originally ordered as a Mk.1 for the RAF and allocated the military serial number AG287. The production batch was subsequently diverted to RCAF use and a new Canadian serial, 1374 was allocated. Delivered on 11 February 1942, she served with the RCAF until being returned to the factory in 1943 to be up-graded to Mk.XII standard - this included the installation of the more powerful Packard built Merlin 29 engine. Returning to RCAF use she was issued to No.1 (F) OTU (Bagotville, Quebec) where she remained until struck off charge on 6 September 1944. Following the end of hostilities the airframe was sold off to the private sector, as were many surviving RCAF Hurricanes at that time, often becoming much needed 'hardware stores' donating their parts to keep the tractors and machinery running on the many enormous farms of the Canadian prairie. Our aircraft was lucky and remained substantially whole and was acquired by collector Jack Arnold in the 1970's. After passing through the hands of other collectors she was purchased by Tony Ditheridge of Hawker Restorations Ltd. Returning to the UK and initially stored as a future personal project, restoration work began in earnest in 2005 at HRL's facility in Suffolk. The project made steady progress until it was acquired by Hangar 11 Collection in 2007 and re-registered as G-HHII. The comprehensive restoration was completed in January 2009 and saw this rare Hurricane rolled out in fighter-bomber configuration resplendent in the markings of BE505, a Manston based Mk IIB operated by 174 (Mauritius) Squadron in spring, 1942. Her first post-restoration flight took place from North Weald on January 27, 2009. Since then, BE505 has joined the Hangar 11 Collection and has become a firm favorite at air displays, representing as she does such a rare version of this famous and much loved classic British fighter.